Full featured Windows Server 2003 partition tool. 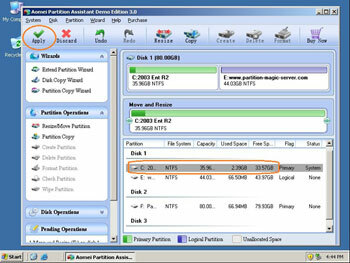 Generally speaking, you need Windows Server 2003 partition tool to optimize the usage of your Server computer disk space. A typical example is that the system C drive running out of space, so you need to merge or resize your Server partition to fix this problem. Furthermore, increasing volumes of information requires companies to make better use of their hard drive space, so the need to reasonably resize, move, split, merge the partitions is more important than ever. Which partition tool for Windows 2003 Server? Partition Magic Server Edition is an ALL-IN-ONE server disk management toolkit for Windows Server 2000, 2003, 2008 and Windows XP, Vista, 7 (32 and 64 bit). It performs basic and advanced hard disk partition maintenance. This flawless hard disk management functions are brought together: Partition Manager, Disk & Partition Copy and Extend Partition Wizard. It allows user to Resize, Merge, Split, Extend system and data partition. Create, Delete, Format, Copy, Repair partition, etc. Enhanced Data Protection technology helps you can merge, resize partition without data loss even when power off or hardware problem occurs. With its User-friendly, it is very easy to operate without professional assistance. You just need to drag and move on the disk map to repartition hard drive. Download the free trial of this Windows 2003 Server partition tool and check how easy it is to manage your Server disk partitions.